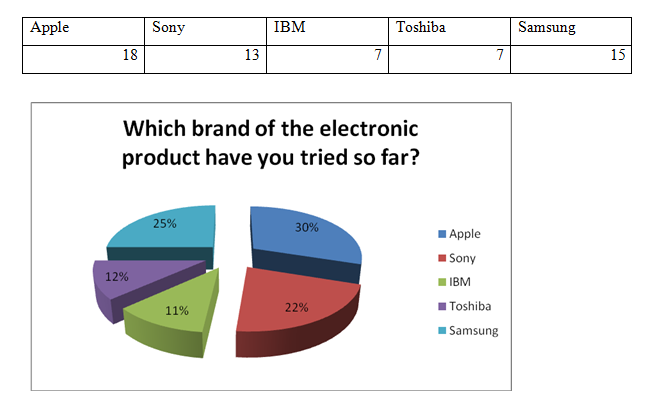 Free Samples Customer Satisfaction & Brand Loyalty In Consumer Electronics Market: Study On Apple Inc. Customer experience incorporates every aspect of the company’s offerings, (Christopher Meyer and André Schwager 2007)be it the after sales service, quality of customer care, which is apparent but also, advertising, product and service features reliability, advertising, ease of use and the list goes on. Customer experience is the direct and indirect contact a potential or existing customer is likely to have with the company. Direct contact involves sales transaction, usage of the product etc. while indirect contact can be through word-of-mouth recommendations or criticism, news reports regarding a firm’s activity etc. customer experience plays a vital role in making an organization future or putting an end to it. This is what keeps the existing customers loyal and attracts potential customers. Existing customers are stay with the firm, as they are satisfied, in other words, it yields to customer satisfaction. When we talk about customer satisfaction, we usually refer to marketing which states how services and products live up to the expectations of the customers(Phillip E.Pfifer 2010). It is very important for a firm to meet the satisfactory goals of its customers, so that they can attain customer loyalty. An organization makes its employee focus on fulfilling the needs of the customers. With happy and content customers the customer satisfaction ratings for the organization soars up. Many organizations have to compete with one another to maximize the customer satisfaction ratings to enhance customer and brand loyalty. Sales and feedback depends on how much the customers are satisfied with the firm and its products. The customer service centers as well as the customers giving their comments on websites or through email can gain feedback. . Customer satisfaction can be described as gratification of customers’ needs and wants (Fournier and Mick, 1999). Taylor and Baker (1994) suggested that there are two main determinants of customer purchasing behavior, which are service quality and product quality. Parasuramal, Zeithaml, and Berry (1994) revealedthat there are less steady of the influence in the product and apparent influence on price in past customer satisfaction studies. They also stated that price is one of the most important factors in yielding customer satisfaction. USB, another world’s leading research firm conducted a survey that what percentage of people will continue to buy the same Smartphone which is manufactured by the same company to their existing usage. The research results showed that an 89% of the people said that they will continue the usage of their product and they will upgrade their devices to the same brand when it is time for an upgrade but they will not be switching to other brands. (Rosati Jake September 22, 2011). Surveys are conducted almost every month by different firms just to see where different technological companies stand as compared to the others, researches have shown that apples background of brand loyalty is the most compared to other Smartphone’s. Study from the GFK research firm shows, that as compared to other Smartphone’s, apple is on the top when it comes to building brand loyalty, (Evans Mike November 26, 2011). 84 percent of the people said that they buy iPhone again when they will replace their mobile model, 60 percent of the people using Smartphone’s with android software said that they will continue using the same software while only 48 percent of the people said that they will stay loyal to phones like blackberry. Examine Customer satisfaction and brand loyalty in consumer electronics industry. Examine the effect of product quality on customer satisfaction and brand loyalty in consumer electronics industry. Examine the impact of innovation in technology on customer satisfaction and brand loyalty in consumer electronics industry. Examine the impact of services of Apple on customer satisfaction and brand loyalty in consumer electronics industry. This research is an effort to get a better understanding of customer satisfaction and the impact of product quality, service quality and price on it. Furthermore, it also pays attention to the brand loyalty that yields from customer satisfaction. Many studies have been conducted regarding the relationship between customer satisfaction and brand loyalty as this topic is of utmost importance to all the organizations in the world. The following chapter provides prior researches based on the relationship between customer satisfaction and brand loyalty. The main objective of businesses is to retain customers and attract new ones, (Inside CRM, 2008). This relationship has been highlighted in one of the articles in which different strategies have been used by various consumer electronics manufacturer to gain customer satisfaction and then eventually benefit from customer loyalty. (Inside CRM editors, 2008). The few strategies used by companies are things like a complete store just for their own products where potential customers can try out their products and if they have any difficulty in using their products they are provided with full assistance. Another smart move by various companies is to produce complementary products such as using a particular application or software in order for the device to function properly. The whole control over hardware, software creates brand loyalty for the customer and the prove of that is when consumers line up in front of their stores nights before their product’s launch. Hence, consumer electronics manufacturers realize that it is important for its customers to be satisfied with their products and this is why they have a strong brand loyalty. A report of Oracle gives a different perspective of relationship between customer satisfaction and brand loyalty, (Clive Meakins & Sujith Abraham, 2003). According to the report, in any industry or business, it costs more to attract and satisfy the customer than to retain them. It suggests that organizations successful at keeping loyal customers lower marketing costs, greater brand value, reduced customer sensitivity and improved financial results. A report analyzing the relationship of the different dimensions of brand loyalty suggests that customer satisfaction is essential to brand loyalty although it does not necessarily generate brand loyalty. (Shultz 2000). Some authors suggest that there is an asymmetric relationship between loyalty and satisfaction. (Wadell, 1995). However, many authors emphasize the importance of satisfaction for gaining loyalty and state that a satisfied customer tends to be more loyal then another customer who is bound by time restriction or lack of information. Some researchers also say that the consumers may not be as loyal to any given brand as their ancestors, they sure are brand loyal to brands but chances are very high that they do not remain loyal to their ancestors’ brands (Bennett, Rebekah, Rundel-Thiele, and Sharyn – 2005). This can because of generation gap and the fast changing pace of technology. This is the main reason brands like Apple, Blackberry and HTC are emerging. Not only the new generation is switching to newer versions to technology but also older generations as these have made life very easy. People tend to change brands not only because they are not satisfied or have had bad experiences but also, because they have to maintain the social class symbol and status. The brand loyalty cycle is said to be emerge from five eras of brand loyalty: the birth of brand loyalty, the golden era, latent, birth of multi brand loyalty and finally the decline. For any company it is very important to satisfy its customers with products live up to their expectations, (Clive Meakings, 2003).Customer satisfaction is seen as tool that would enhance the company’s sales as well as reputation. To improve brand loyalty, it is vital to increase satisfied customers. Communication is the key to derive feedback from the customers and capture their views, both positive and negative, which makes the company understand what changes to implement. In addition, companies need to find effective ways to reach customers and their needs. With happy customers comes loyal customers and with loyal customers any company can expect increase in their future sales. There are whole departments that are based on customer satisfaction services to boost brand loyalty amongst customers. In one of the articles, the author has said that apple has a very large number of satisfied customers( Akash Aggarwal April 2011), and this is the reason of their success not that they have a large number of people that are very much devoted and obsessive about the product or the organization. The reason behind the this customer satisfaction according to the author is that all the products that HTC, Apple and Microsoft have manufactured are design in such a way that they will be user friendly and customers will be able to use and enjoy the product even if they are not that technically sound. According to the author he states that consumer electronics manufacturers have been successful in capturing the teen’s market by sustaining its reputation and providing products of supreme quality and high technology. As per the author teens are very much amongst the population to start something new and are up to date with the latest trends and technology and are attracted by the physical appearance of a product, which results a trend in technology. In the article the author has given the example of iPod, that how iPod with its stylish looks and design attracted by the youth. IPod has surely take the portable music industry to a next level and now apple shows the way to an invention to the technology that provides entertainment. Another study shows that customer satisfaction is basedon customer experience, (Jon Buys, 2009). A customer’s experience can vary from person to person. A product should offer the best experience to a customer and live up to the claims that the firm expressed about the product. There is no doubt that Apple, HTC, Microsoft and Nokia’s products have been a success with customers, it is said that these companies have brought a revolution in the field of computer electronics and gadgets. The new and innovative technologies such as the IPad and iPod have been instant hits. The customers are raving for modifications of these products and are willing to pay huge prices for new version on such products. Since that last decade, Apple has made millions of loyal customers who have switch to Apple for all of their computer technological needs MacBook offers a completely new dimension to laptops with its design and sleek body. IPods have redefined listening to music and personalizing it. The Apple ITunes store online has given been considered as a revolution to online buying, and the customers are at an ease to shop at ITunes for all their entertainment needs. The company has made sure that price of their products are suitable for customers to buy. It is stated in the article that according to mobile phones, Apple’s iPhone has the best price for a touch phone with such features. The company has a 14-day return policy, but other companies such as HP and Dell have return policies lasting to 21 days. It is very prominent that Apple is highly popular with its audiences and has done an impressive job in making its name in the markets, with the highest customer satisfaction rating recorded. Brand loyalty refers to a customer’s dedication to purchase the desired product again or continuing the usage of the product, (Ashish, himanshu; Rajiv, Shantanu). The article tells about different types of brand loyalty like when customer purchases or repurchases a product due to the lack of alternatives, or in situations where the customer is out of handiness, this type of loyalty is referred as “spurious loyalty”. However true brand loyalty lies when the customer is delighted from the services of the product and is willing to buy the product at a higher cost, even if the alternative product is of fewer prices. This is the power of brand. Certain researches show that how Apple has been able to satisfy its customer and the reasons that it will be easily able to maintain and retain its current customer base. (Morningstar Equity Research, 2011). It says that the most important part of Apple’s strategy is to create a bond with its customers through focusing on usability than technology. The basic reason for customers satisfaction is the fact that Apple iPhones are very user friendly and do not require an instruction is manual to operate. The latest model, iPhone 4s offer less innovative technology and yet it is able to attract a number of customers. The reason people are still willing to purchase its iPhones is that they have been satisfied with its service before. Companies like Microsoft created brand loyalty through the unbreakable bond between the user and the applications. Apple has acquired a brand loyalty with its customers in which if one of their products fails such as iPhone 4s, they will not start purchasing android or HTC smart phones, but actually wait for iPhone 5. Another tactic used by Apple to maintain brand loyalty is that consumers will find it hard to switch to other products as they have already spent significant sums on its apps. Hence, Apple has gained a position in the market through customer satisfaction where a few failed products will not affect its loyal fan base. For consumer electronics manufacturers, it is an asset to have satisfied customers, (Jon Tews, 2009), due to their soaring rate of customer satisfaction ratings. As stated in one article, Apple’s products are in front of their own separate competitors. The company’s sales are blooming day by day due to new and innovative technologies and their loyal customers who wait anxiously for any new update about a product. Since the last five years Apple, HTC, Nokia, Samsung have become the leaders in cell phone manufacture industry. Their products have high demands in various audiences due to numerous applications, specially the youth. Apple’s products such as the iPod; iPod and Mac Book have also been considered as customer favorites. Apple has many retail stores in more than 44 countries as well as an online retail store and customer service center. To reach its customers apple has keen employees in their outlets to help and guide the customers also provide them information that they require. AppleCare is Apple’s online service center, which is always there to give answers to any questions raised by people regarding Apple’s products. Apple is one company who has provided its customers with the top most quality in its products, services and reliability. Apple, like any other company is striving to catch its flaws and sort them out as soon as possible. One issue that Apple has to target and find a solution is the problem with its backup. There are many complaints made the user regarding the backup, the users don’t know when to sync their Apple devices such their Iphone with the Mac book. If they did not synchronize information in time, the user might lose his primary information. Unlike Google, Apple lacks in finding a reliable primary storage capacity. There have also been some defects in its new iPod being unable to connect to wireless networks. This has been an issue with some other products of Apple as well like the Iphone and IPod. Apple needs to improve its technology dealing with the connection issues, because its competitors have scored better than Apple regarding connection to wireless networks. According to the user, they state that when an Apple device searches for a Wi-Fi network it has troubles to find it and connect to it. One more issue with Apple is security, due to which criminal hackers can crack the jail break code and download many types of software that aren’t approved by Apple. The jailbreak tool relies on vulnerabilities in existing Apple binaries that are loaded using standard functions, Pod2g said. Researchers used to create data pages that could be loaded on to the device to launch the jailbreak code prior to iOS 5. The Corona jailbreak has been added to the redsn0w packages that can be used to untether devices. It can be downloaded from Websites belonging to two Apple hacking groups, greenpois0n and the IPhone Dev Team. It appears that Pod2g is also working on a jailbreak update that would work on iOS devices that use the A5 chip, such as the iPhone 4S. One issue that has been raised against apple is of business problems of child labor and other unsavory practices. The company has been accused of providing employment to underage working, which resulted in child labor. This would risk Apple reputation in the market and amongst its customers. It is very important for a company to keep close attention to the practices that are being carried out in their other agencies. Another gap in apple is the prices of the hardware of its products. Apple’s battery cost is three fourths of the price of an Iphone; the accessories are the most expensive as compared to its competitors. Many customers of Apple have stated that they have a problem with the prices of Apple commodities, and prices of its software that have to be downloaded. From the above analysis of various previous studies conducted to identify the relationship between customer satisfaction and brand loyalty, it becomes clear that they are directly proportional. The more satisfied the customers are, there are more chances of them to carry out repeated purchases and be loyal to the product in the face of competition. In this chapter the research methodology of the research is discussed. The purpose of this research was to examine the impact of pricing, innovation in technology, product quality and services of apple towards customer satisfaction. The research methodology includes how the research was conducted and was the limitations that were faced in making the report. The sample size for this was taken from 100 individuals out of which 60 of the respondents replied and the analysis is based on the findings of these 60 respondents result. The questionnaire was given out in person, some by mail. Random sampling and convenient sampling methods were used in this study. The questionnaires were distributed in the posh areas of Karachi mainly the malls and famous restaurants so as to get feedback from people. The places where the questionnaires were distributed were Park towers, Forum, hyper star, hardies, Pizza hut, Atrium mall and Dolman mall. Target market that is the people who were selected from which the analysis is conducted was the youth as maximum of the electronic products are used by the youth secondly the people who have knowledge about the electronic products as well as apple and its products because Apple was the subject which is related to the case. Also shop owners and people in the electronic industry were also targeted for the interview so that feedback regarding the customer satisfaction and brand loyalty can be observed. Interviews were conducted to attain feedback regarding the research four people were interviewed in the making of this data analysis. All questions were structured and the time duration per interview was 20- 30 minutes maximum. The first person to be interviewed was the sales representative of Hyper star, he told us that most of the people come to check out the electronics area he further told us that according to his own observation people, when purchasing the electronic items go for brands. He said that Apple, Sony and Samsung brands make most of the sale. According to his observation pricing and brand are the two factors that attract customers. As the youth follow music and they keep a close watch on what their favorite celebrities as to what sort of clothing and what electronic products do they have so the second interview was conducted by the famous Pakistani singer Atif aslam. He took out time and explained that as the youth follow its favorite celebrities most of the electronic products owner uses models and other celebrities to advertise their products. He further told that he has also advertised electronic products like cell phones. Another interview was taken from the smart phone shops sales person he told that smart phones are the only electronic item that makes most of the sale he also told about the buying behavior of consumers that they go for branded items According to him majority of his customers purchase Apple products as it is considered as a style statement. A focus group was conducted that consisted of 20 people a moderator and a researcher who is also the observer. The reason for conducting a focus group is to get different feedback from different people at a time. This allows the researcher to get information regarding the topic very easily. Question regarding the usage of electronic products were asked and question regarding brand and customer satisfaction were asked. With the help of focus group analysis regarding the consumer buying behavior of electronic products was clearly understood. The limitations in the making of this report were firstly time. There was limited time due to which the only selected areas were selected as the units of study. Furthermore the respondents didn’t have much time to answer to the questions as they were busy in their own shopping or other activity. Difficulty was faced in distributing the question to the respondents as many of the respondents didn’t stop for interaction. Also due to the shortage of time interview from some of the manufacturing and distributing people from the electronic department were not taken. One of the limitations of the report is that it is only focusing on the response of the people in Karachi and instead of Pakistan as a whole. Furthermore in Karachi only specific areas were targeted such as defense and Clifton. Secondly the electronic consumers are all over Pakistan but due to the lack of time and money it was difficult to tackle all areas of Pakistan. The economic situation of Pakistan is no that stable. As the buying power of the people is decreasing they are not willing to spend into luxury items. Instead they prefer to fill their basic needs and save money for the rainy days. This chapter aims to analyze the data collected through various questionnaires and also relate the data to the literature theories applied in chapter 2. The objective of asking such questions to the audience is to determine the relationship between customer satisfaction and brand loyalty. This research required a deep understanding of customer satisfaction and hence it became very important to ask questions relating to customer satisfaction and what perceptions do different people have about them. Before collecting the responses, it was not clear if managers could provide a better answer or the customers themselves. The feedback suggests that the random managers who were asked the question had a different perception of customer satisfaction; however, there were areas of agreement which proves that customer satisfaction is basically when the customer is happy with the product. The customers also have a similar view of customer satisfaction and they think for the customers to be satisfied, it is important for products to live up to their expectation be their product should prove to be consistent with their claims. This is consistent with the theory discussed in the literature review when a product’s perceived performance matches a buyer’s expectations (Kotler & Armstrong, 2008). It was assumed that customers might not have any idea about customer satisfaction but apparently some of them did and they were very precise in giving the answer. Since the research analysis the relationship between customer satisfaction and brand loyalty, it becomes essential to ask people of what they think is brand loyalty and how much do they believe in such a concept in today’s price competitive market. This question represents conflicting views from the audience. One manager thinks that is possible to retain customers through brand loyalty by offering them good quality. However, many people think that in such tough economic times, when many people are unemployed, it is not possible to purchase products that cost more. Hence, any cheaper alternative offered will be purchased, rather than sticking to the expensive one because it satisfies your need. The fact that customers buy your product even when cheaper alternatives exits s complying with one of the theories discussed in the literature review. Brand loyalty is also seen as when consumers consistently buy a product even when the competing products offer lower prices (Huang & Perloff, 2005). Audience also responded that preference of one product over another is known as brand loyalty (brandchannel.com, 2006). Hence, it is clear that certain theories discussed in chapter 2 agree with the audience’s response about their perceptions of brand loyalty. It was essential to ask a question relating to how important customer satisfaction and brand loyalty are to an organization. It is quite obvious, even through the literature review shows that, innumerable researches and studies have been conducted on the topic of customer satisfaction and brand loyalty which proves that it is essential for business success. However, there are some people who are ready to challenge these concepts and claim that business success could be achieved without customer satisfaction and brand loyalty. From the above responses, it seems that customer satisfaction is very significant for the businesses. For any company it is very important to satisfy its customers with products live up to their expectations. (Clive Meakings, 2003). However, there are people who still think that there are more important things then customer satisfaction such as efficiency and profits. A question was asked about the monthly income of customers as it was an important factor contributing to knowing how price sensitive customers are. If they have a very low income then for them brand loyalty is almost non-existent and if reasonable to high, then customer satisfaction is very important for them. The above responses prove that income has a huge affect on customer satisfaction and brand loyalty. It must be agreed that every consumer’s needs customer satisfaction as it is the integral part of a product. However, the tendency to stick to one product despite of cheaper options varies with a person’s income. The lower the income, the lesser brand loyalty. However, if the product is cheap but the customer is satisfied with it, band loyalty plays its part. Question regarding how often people buy electronic goods was asked as it was important to find out with what frequency these people buy electronic goods because this way we will be able to determine whether every time they purchase the product, do they purchase it from the same brand they did from before. The next question was asked relating to Apple and to see the performance of their product. It was asked that how long you have been using an apple product for. The response from the customers was not at all surprising. “You can call me a brand ambassador of Apple as I have their laptops, iPhones, mp3 players and what not. My iPod is almost 5 years old and I am still not ready to give it away as it works perfectly fine. I have been using iPhone 3 for almost 2 years now and I was never disappointed with its performance. Having said that, I am looking forward to the buying the iPhone 4S just so that I can keep up with my friends. It was also asked from the customers that how many electronic brands they have tried so far so as to know how often customers switch in between brands. The above answer shows that almost all of the correspondents have tried Apple products. The reason for them trying its products is that due to word of mouth and buzz marketing, they are forced to try the product even if they don’t want to. Certain researches show that how Apple has been able to satisfy its customer and the reasons that it will be easily able to maintain and retain its current customer base. (Morningstar Equity Research, 2011). Sony comes in second after apple as its marketing and its brand name speak for itself and many people have become loyal toward its products. It is important to know what makes a consumer use a particular brand and hence we asked the audience about what made them use the brand in the first place. “I started using Samsung after I watched its advertisements on TV. It was very reasonable for me and it fulfilled most of my requirements so I started using it. It is proved that majority of the people use products because their friends suggest them to use a particular product. Advertising has some part to play in influencing their purchase choices but they mainly learn it through their friends circle. Another important question relating to this research is how easily are consumers able to switch to another product once they have started using it. It is an important question as we have to see how important brand loyalty is in this age. The responses from this question showed that 30% of people did not find it easy to switch to another brand (John Buys, 2009) the better experience that they have with the product, the more difficult it becomes to shift to another one. However, 20% of people believe that they do not form emotional attachments to brands or products and hence try using different products from time to time (John L Giese & Joseph A. Cote, 2000). This supports our theory from literature review that customer satisfaction and brand loyalty are basically emotional and cognitive responses to a product. From the above analysis of the data collected from questionnaires and interviews, it becomes clear that customer satisfaction and brand loyalty are directly linked to each other. No matter how much people try to disagree but this is a fact and the literature review with the data analysis proves that. In addition, it is proved that customer satisfaction and brand loyalty are two most significant aspects of business without which it cannot survive. Brand loyalty is the key to an organizations success and customer satisfaction leads the way to brand loyalty. A company can never expect dissatisfied customers to come back and buy their product and become loyal customers. In what incomegroup do you belong [income of family P.M.? How often do you buy electronic goods? Which brand of the electronic product have you tried so far? Which advertising media would influence you? What influences you in the advertisement? What made you start using that electronic brand? What factors do you consider important in buying any brand of electronic product. Please give points to attributes out of total 100 points. I buy product which matches my lifestyle and taste. Which brand comes to you mind when you think of high end MP3/PVP player? Which brand comes to you mind when you think of high end cell phone? Which brand comes to your mind when you think of high end desktop? Which brand comes to you mind when you think of high end laptops? For any company customer satisfaction is an important asset, for which they have to raise the level of positive experience of a customer. If a product meets the expectations of the customer it increases the customer satisfaction ratings of the firm as well as enhances the brand loyalty of the product. A customer looks for the best and desirable experience from the usage of the products, not only that but also the services provided by the company. Customer satisfaction exhibits the relationship between the company and the customer. As the rivalry of products and companies grow the market has become even more competitive than before, with new and innovative technology and creative ideas gives one company an edge over its competitors. With all the new products coming in the markets and the competitors fighting for that edge over one another, brand loyalty for a company is a vital weapon to win the and be on top of its competitors. To enhance brand loyalty and customer satisfaction, companies bring out services like service centers as well as temporarily using the product in the respective stores. The electronic markets that consists of consumer electronic products, hardware and software, mobile phones and other electronic gadgets has become of the most profitable and growing markets of present. In this research a questionnaire has been distributed and focuses on different consumer electronic products, brand loyalty and awareness of products. This analysis clearly shows that consumer electronics have become a necessity such as cell phones and laptops. Many brands are competing to be on top and be the choice of all the customers and apple has been a popular selection among the people. Advertising and new promotional ideas by companies create awareness regarding their products and create hype. Apple’s name in cell phones and other consumer electronics has been the most prominent and accepted. Apple has been the most liked and appreciated brand in cell phones with is Iphone. Apple is one company who is enjoying being on top of its league and has out shined all of its competitors in all fields. Apple has raised its revenues over $108 billion in 2011 as well as ranks on top of customer satisfaction ratings. Apple has brought a revolution to the world of consumer electronic with its products like Iphone, iPod, iPod, Mac book etc. Apple has lived up to the expectations of its customers and satisfied their needs. Apple’s promises that its products give the most excellent experience to its customers and the customers are highly contented. Amongst the youth Apple’s products are most accepted and popular such as the Iphone, IPod and theIPod, these products are considered to be in “trend” by the youngsters. Apple has customers in audiences of all ages from pre teen, teens to adults and also businessmen. With such a large target market is has done a great job in maintaining its customer satisfaction rating as well as living up to the high expectations of its customers. As the consumer electronic market is expanding and reaching new heights it’s essential for companies to stay close to the enhancement of technologies or else they will become obsolete. Technology is changing day to day and the customers want something new and different. Being a company in such a market it has to have effective research and development departments in their firm so they can come up with innovative products. It is said that people have seen it all in terms of technology but there is still something new to come. Companies such as Apple has given that something new to the world with its touch phones to IPods which have created a revolution and changed the look of MP3 players and the IPod that is somewhere between a laptop and a mobile phone. Apple has now succeed exceptionally well in its market and still has to maintain its position there. With the people waiting for new editions of its products to a whole new product Apple needs to find new ideas every day. There might be some issues with some of apple’s products that customers have raised, for Apple to maintain its reputation it has to find ways to overcome those problems and make the customers satisfied. Consumer electronics market has become a highly competitive market and all the companies have to come up with products that are different from one another of find new ways to make the products diverse from the competitors. Promotion and advertising is a tool to reach to the customers, companies need to make advertisements and promotional techniques that will create a desire for the customers to want a product. Companies manufacturing laptops and computers should keep on enhancing their products and come up with something new to bring to their product, a new design or software. Mobiles phone companies are finding ways to diversify their products and bring out to the market a mobile phone that promises something that no other mobile phone has, like Apple being the pioneer of the “touch” and brought Iphone to the world. New features and applications are considered to be an attraction and companies have to strive and find ways to achieve this attraction of the people. For the consumer electronic market, companies have to come up with state of the art technologies and latest and innovative promising features to their products as well as original products.